The Segway was heralded by inventor and design engineer Dean Kamen as a transport device that "will be to the car what the car was to the horse and buggy." Go here if you are not familiar with Kamen or the Segway. Kamen spoke of all the sophisticated security devices to prevent theft, but in my opinion, he missed the problem of vandalism, not theft. Perhaps he doesn't know New York. Why would someone vandalize something they could not steal? For many reasons (like taking parts) and perhaps one reason not understandable to outsiders: because they can. I'm sure people will take parts they do not know they have use for, because they are there. Manhattan is a graveyard for abandoned bicycles, like the one in today's photo taken on Spring Street. 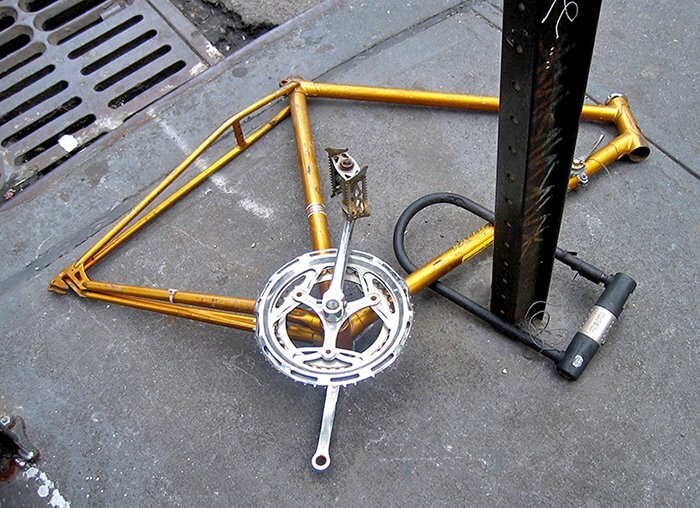 Many bikes are stolen, even with special locks like the Kryptonite, and if they can't steal the bike, they will steal unlocked parts - yes there are ways of locking individual components, e.g. like seats. When you arrive to see your bike stripped like that in the photo, I imagine it is rather disheartening. What's the point in taking the frame and where will you dispose of it anyway? In 2005, sculptor David Shapiro did an outdoor exhibit, Left for Dead, at the Socrates Sculpture Park in Long Island City. A melange of twisted abandoned bikes in various states were salvaged from the streets of the city. In the exhibit, Shapiro attached them to sign posts, embedded in the ground. And a thief was found to attempted to steal a seat from an exhibited bike.